Whether you're a dedicated shooter, hunter or even a firearms hobbyist, keeping your gun clean at all times is critical in ensuring it performs flawlessly whenever you pull the trigger. What happens when you fire your gun is that some residue is left behind by the gun powder. And if allowed to accumulate, it can seriously affect your weapon functionality (and hence your shot accuracy!). The more regularly you use your weapon, the more this residue is likely to accumulate and cause problems. In today’s post, we want to reveal to you the secrets to choosing the best gun cleaning kit (for your specific weapon type) that gets the job done. Plus, we’ll give you a rundown of the 10 most effective firearm cleaning kits that pro shooters have been using for years to keep their weapons clean and up to the task. What Do You Need To Clean Your Gun? Different gun cleaning kits might come with varying lists of items for cleaning your weapon. But there are certain must-have items in any kit to help you clean your firearm the right away. Cleaning solvent: this is definitely one of the most important items for cleaning your weapon. The solvent is simply a liquid that you out in the action and barrel of your firearm to help loosen up any residue (excess carbon, gunpowder) present. Lubricating oil: this helps protect your gun metallic parts from rusting, corroding, and other forms of wear. It also acts as a lubricant for the moving parts of your weapon. Bore brush: as you can easily tell, the purpose of this brush is to penetrate deep inside the barrel and clean it up by loosening any residue present. Cleaning patches (and patch holder): usually made from cotton, patches act as washcloths for your gun—helping wipe off the residue inside the barrel. The patch holder enables you to push the patches inside the barrel (a cleaning jag can be used in place of patch holder). Cleaning rod: these will help reach deep down the barrel of your firearm for thorough cleaning. They come in different sizes to fit different caliber guns. 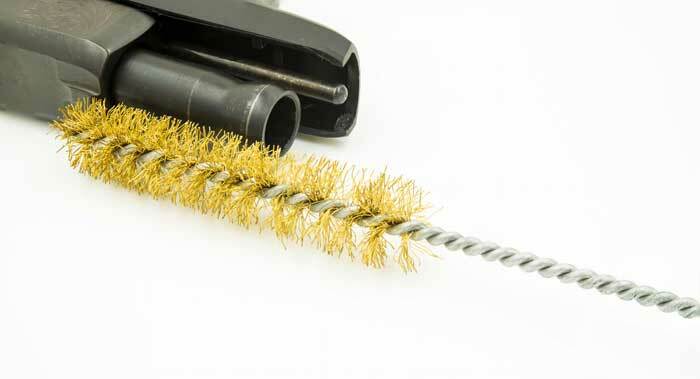 Cleaning brush: available in different materials, like bronze, nylon, etc., brushes attach to the cleaning rod above to help you easily remove any residue, dirt, etc., stuck inside your gun barrel. They can also be sued to clean the exterior of your weapon. If your gun cleaning kit comes with the items list above, then it’s a perfect package that you can use to clean almost any type of firearm. 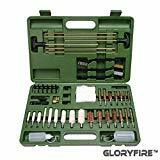 GLORYFIRE Universal cleaning kit is one of the best gun cleaning kits currently available at the market. It’s an all-in-one kit that provides you with everything you need to clean all types of gun including—rifles, shotguns, and pistols. The universal kit provides you with a whopping total of 160 pieces to ensure you have everything you need to clean any part of any given gun. It features different size cleaning rods plus all the required adapters to fit just any gun barrel. And these pieces aren’t made of the cheap plastic you’ll find in most models out there. Instead, they’re designed using top-quality brass and nylon plastic to allow you to use them for a pretty long time without any breakages. Because the manufacturer has clearly labeled the sizes of the different pieces that come with this kit, both beginners and professionals will have an easy time using as they’ll know what piece to use for what gun. Keep in mind that this kit comes with a lightweight, durable plastic carrying case. This helps keep all your items well organized. Plus, it facilitates easy transportation of the kit to any place. Next on our list is the Otis Elite Cleaning System. 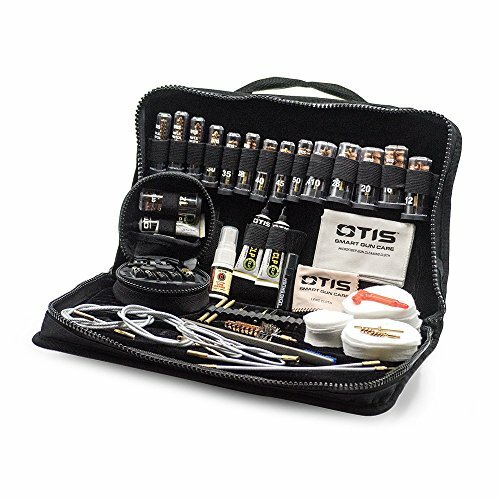 This is a product of Otis Technology, one of the few companies with the most advanced gun cleaning systems and accessories across the entire globe. Like the previous kit, this system also provides you with all the right cleaning tools in one complete and portable system. It’s suitable for cleaning the .17 to .50 cal. Rifles and pistols, all the .410 to 12/10 ga. shotguns, and all inline muzzleloaders. It comes equipped with a total of 6 Memory-Flex Cables (with varying lengths) that works with all Otis cleaning components. Combine these cables with the 100% cotton cleaning patches, solid brass slotted tips, bore brush, lubricant, and preservative, and cleaning your weapon from the breech-to-muzzle becomes easier than ever before. The package also presents you with as many as 22 bore brushes. These caliber-specific brushes are color-coded and come with sizes indicated on them to ensure that even a beginner will easily know what type of brush to use for any given gun. Inside the package, you’ll also get Otis brass scraper set. This comprises of the scraper, locking lug scraper, pin punch, straight pick, compact receiver brush, nylon end brush, and two rod handles. All these handy tools will help you clean the hard to reach areas of your firearm without causing any scratches. As a BONUS, this cleaning system also comes with optics cleaning gear to help you take proper care and maintenance of your rangefinder, scopes, laser sighting devices, cameras, binoculars, eyewear, etc. And yes, all the cleaning kits and accessories come packed in a compact soft pack case to facilitate neatness and easy carry. 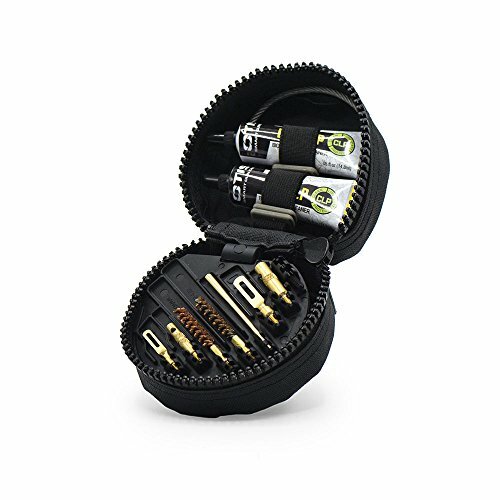 If you’ve got multiple firearms, we suggest that you invest in this professional grade Allen Ultimate Gun Cleaning Kit to help you take care of them the right way. 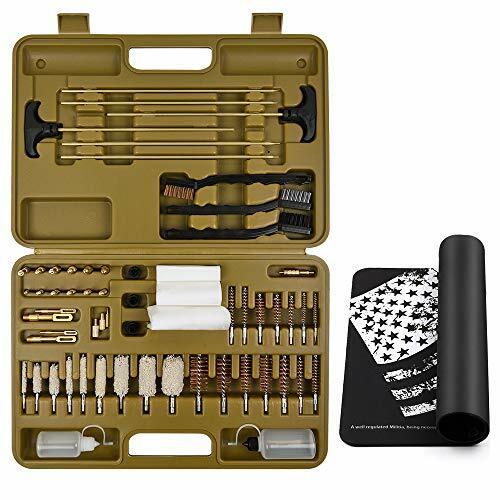 This ultimate gun cleaning kit features a total of 65 pieces, all of which are made from high-grade bronze, brass, and plastic materials to ensure they don’t break easily. Each cleaning tool has its own storage compartment to ensure easy organization. What’s more, these compartments are labeled with the items name/size to allow you to easily retrieve any of them when the need arises. Given that this cleaning kit is designed with the traditional shooter in mind, you shouldn’t be surprised to find out that it also comes with cleaning accessories for the 12 gauge, 20 gauge, and .410 bore shotguns…and even the standard rifle and pistol calibers. The storage box has extra space where you can easily fit extra patches, cleaning clothes, cleaning chemicals, and extra brushes or jags. Hoppe’s is a respected name in the firearms world, so it shouldn’t be surprising that we have their product on our list of top gun cleaning kit reviews. The Hoppe's No. 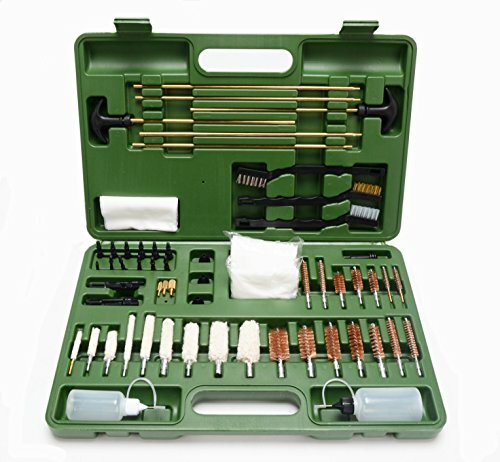 9 Deluxe Gun Cleaning Kit is a universal gun cleaning system that allows you to clean all types of guns including pistols, shotguns, and rifles. Inside the kit, you’ll get a total of 5 phosphor bronze brushes which can easily fit different types of guns. The brushes also feature stout bristles to ensure more effective cleaning results. The kit also comes with a 3-piece brass rod with ball bearing swivel handle to easily follow the bore rifling. Other items included in this cleaning kit include the silicone cleaning cloth and lubricating oil, which further ensure that your firearm(s) remain in top condition at all times. All these cleaning items and accessories are included in a heavy-duty wooden box. This ensures everything stays and together and in an organized manner for easy, quick retrieval. You’ll find the BONUS “Guide to Gun Care” booklet is included in this package quite helpful. FIREGEAR Gun Cleaning Kit is also popular among shooters and hunters with multiple firearms. As a universal cleaning tool, it comes with everything you need to clean all types of guns, including pistols, rifles, and muzzleloaders. Like the previously discussed kit, this cleaning system also comes with high-quality solid brass cleaning accessories to prevent breakage and extend longevity. These accessories include 3 solid brass rods for cleaning .17-.270 caliber rifles, and an additional 3 solid brass rods for .30 caliber rifles, pistols, muzzleloaders, and shotguns. Other items you’ll get in this cleaning kit include one black powder jag, 14 brass brushes, 12 gun jags, 9 bore mops, 3 utility brushes, 4 slotted patch loops, 3 muzzle guards, 3 accessory adapters, and 4 polishing cloths. It also provides you with 2 empty bottles where you can put your gun oil. Keeping all these items neat and organized shouldn’t be a problem, thanks to the lightweight, durable plastic case it comes with. The same case makes the kit more convenient and easier to carry around. Are you tired of gun cleaning kits whose plastic jags easily break in the rod after only a few washes? If yes, you should consider getting yourself this premium gun cleaning kit and enjoy longer lasting gun cleaning accessories. Top-quality solid brass is used to construct all the gun jags and slotted tips. Not only that, all the cleaning rods and accessory adapters are also made from the same high-grade material. The result is a gun cleaning package that works like a charm and lasts a lifetime. What’s inside the package? You’ll get 6 gun rods, 4 slotted tips, 13 gun jags, 9 gun mops, 3 muzzle guards, 14 bore brushes, 3 accessory adapters, 100 cleaning patches, 4 polishing cloths, 2 empty oil bottles, and a cleaning mat. Keep in mind that different cleaning items are clearly marked as to which caliber to use them with, eliminating the guesswork. The complete user guide will make this kit easier to for beginners as well as professionals. EVERYTHING is stored in its own compartment in the latched durable all-weather case for the ultimate neatness and easy organization. The best part is that this case has plastic lock closure to help you securely lock up all your cleaning accessories. As a hunter who loves his firearms and wants to keep them ready for action at all times, you can’t go wrong with the Freetime Upgraded Version Gun Cleaning Kit. This is another excellent gun cleaning kit that’ll help you take care of all common caliber firearms and extend their lifespan. The kit comes packed with all the necessary supplies you need to take care of your .30 caliber rifles, shotguns, pistols, and muzzleloaders the right way. These supplies include up to 14 brushes, 12 spear pointed jags, 1 black power jag, 9 mops, 4 slotted patch loops,3 muzzle guards, 3 utility brushes, 3 accessory adapters, 50 (3x3”) cleaning patches, 50 (3x 1½”) cleaning patches, up to 4 polishing cloths, and 2 empty oil bottles. Similar to the other top-rated gun cleaning kits, these supplies (the cleaning rods and accessory adapters) boast of quality brass construction. The jags too are made of top-quality plastic nylon. This dramatically minimizes chances of breakages, enabling the entire kit to serve you for longer. Maintaining all these pieces in one place can be a headache. 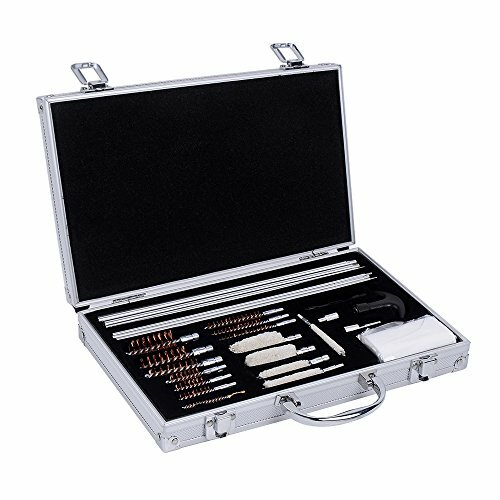 That’s why the manufacturer will send you this kit with a durable plastic carrying case to help you neatly organized the components. The case will prevent the loss of these pieces while allowing you to carry it with you to any place easily. Here’s another exceptional popular pistol/rifle/shotgun cleaning kit for hunters and shooters who own multiple guns. 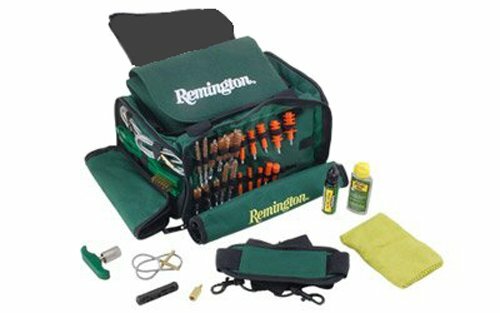 Proudly manufactured by Remington, the respected brand in guns’ world, you can rest assured that this kit will help you clean your weapons the best way. If you own any 12-gauge shotgun, .45 caliber revolver, or .22 caliber pistol, this cleaning system should be able to meet all your gun cleaning needs. The set comes with 10 different bore brushes—with differing lengths and widths. These work with Rem’s special Squeeg-E technology to enable you to hassle-freely the barrel of any gun without necessarily using patches. What’s more, the kit provides you with an adjustable T-shaped handle. This easily attaches to any of the above brushes to offer you a large, ergonomic grip for easy grip when cleaning. You’ll also get a 0.5-ounce Rem all in bore cleaner that makes residue breakdown struggle-free. This is 100% non-toxic solvent with fairly thick consistency that won’t easily absorb into the cleaning patches. Other essential items that come with this cleaning kit include gun cloth for cleaning your gun exterior, gun pad for keeping your weapon safe during storage/transfer. All the components of this set come included in a soft, flexible and extremely lightweight carry bag (with multiple zippered pockets). Plus, this bag has a padded shoulder strap to facilitate easy transpiration of your gun cleaning gear. Looking for the best rifle cleaning kit? If yes, you’ll find Allen Tactical Gun/Rifle Cleaning Kit a great choice. The packaged supplies with all that you need to clean your handgun and tactical rifle calibers, MSR (modern sporting rifle), and 12 and 20 gauge shotguns. Like the other Allen cleaning kit, this model also comprises of high-grade cleaning components. 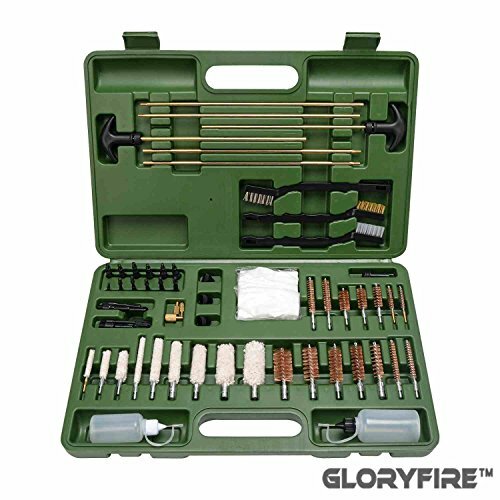 These include the brass hags, brass adapters, brass slotted tips, and bronze bore brushes. Besides, the kit also comes with cotton swabs, upper receiver brush, bronze bore brushes and 3 specialty MSR tools. 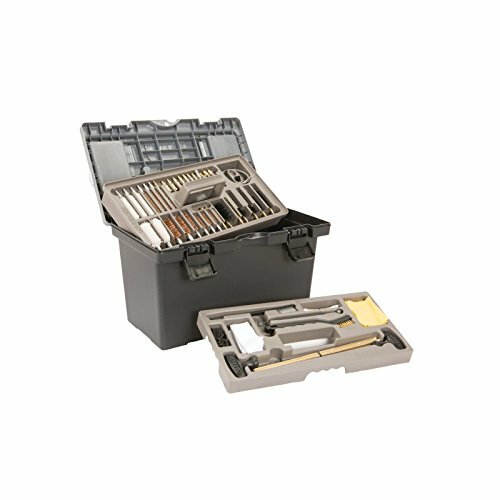 It’s also worth noting that this kit comes with a toolbox specially designing for gun cleaning. This box has handy labeled slots to help you keep your cleaning supplies organized. Plus, it manages to leave extra space for extra patches, cleaning chemicals, and small items (e.g., jags and brushes). XtremepowerUS 106pc comes at a fair price tag while providing you with all the components you need to clean different types of firearms. The cleaning system provides you with a total of 106 pieces to ensure you have every single item you need to clean your rifle, pistol, shotgun, or handgun. It has a total of 55 cleaning patches for cleaning various rifles. It also features solid brass adapters for rifle/pistol brushes and mops and for shotgun mops/brushes. 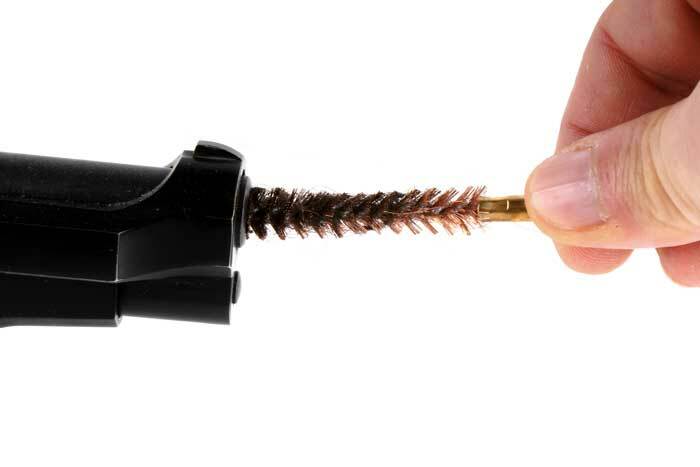 10 brass wire brushes are included to help you easily clean these guns: 20/28 gauge, 10/12 gauge, 410, and 45c. The fact that the manufacturer sends you this package with a diagram showing the caliber/gauge of different brushes makes it extremely easy to use for beginners as well as professionals. It’ll also provide you with 2 plastic slotted tips for clearing your firearm—whether it’s a shotgun, rifle or pistol. Above all, it features a nice-looking, lightweight carry case for convenient storage and transportation of all your gun cleaning supplies. For all your shotgun, rifle or handgun cleaning kit needs, the Ohuhu universal gun cleaning kit will not disappoint you. The all-in-one gun cleaning kit provides you with a total of 28 pieces of cleaning accessories that’ll help you keep all your firearms in top notch condition. Out of these accessories, 6 are sturdy stainless steel cleaning rods (3 rods for rifles and 3 for shotguns). Other items that come with this cleaning system include 10 solid brass cleaning brushes (with varying sizes: 0/12, 20/28, 410, 45, 40, 357/38, 17, 30, 270/280, 22). It also features a total of 5 cotton cleaning brushes (with varying sizes: 10/12, 20/28, 410, 357/38, 22). The durable aluminum carrying case that holds the above cleaning accessories facilitates easy organization and convenient transportation to any place you want. 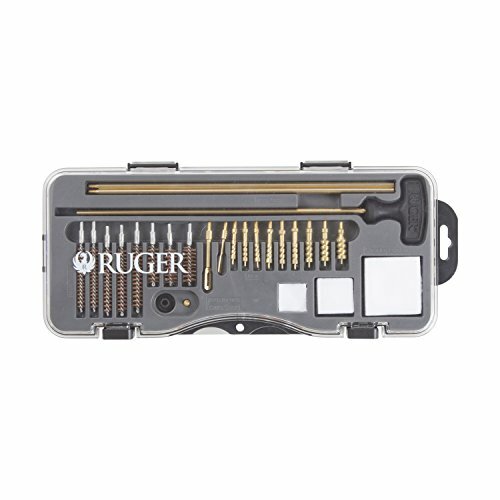 If you’re on the hunt for the best handgun cleaning kit, we suggest that you consider this Allen Ruger Rifle & Handgun Cleaning Kit as one of your top choices. The complete universal cleaning kit comes with all the must-have accessories for cleaning multiple caliber rifles and handguns. It features different cleaning jags for the 45, .40, .357/9mm, .30, .284/7mm, .270, .25, .243, and .22 caliber. And different bore bronze brushes for.45, .40, .357/9mm, .30, .270, .25, .243, and .22 caliber. It also presents you with multi-piece rod with handle, brushes, rod tips, muzzle guard, and swabs to ensure you’ve everything you need to keep your guns clean and ready for a flawless performance. Remember that all these accessories are made from high-quality brass materials to ensure they don’t break easily. This is a kit you might even pass down to your children. The only thing you’ll need to buy separately is the gun solvent and lubricating oils. However, purchasing these items separately won’t be hard on your wallet, given that this kit comes with a pocket-friendly cost. With the molded toolbox that holds all these items, you can easily take this handgun cleaning kit with you to any place. 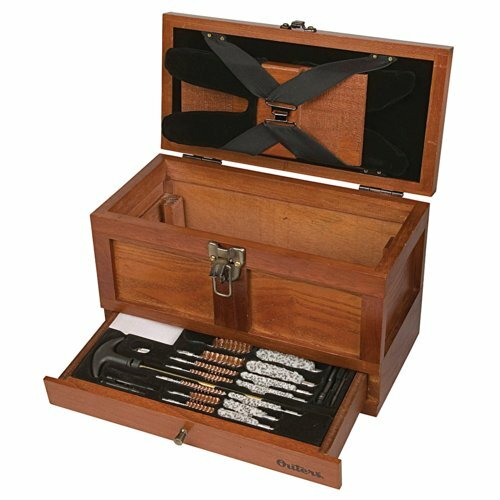 If hunting is what you do best, you’d want to look for a cleaning tool chest specially made for cleaning a variety of firearms related to hunting. 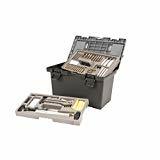 And one such kit is the Outers 70084 25 - Piece Universal gun cleaning kit. The all in one universal cleaning kit features a total of 25pc high-quality cleaning accessories to help meet your cleaning needs for a wide variety of firearms. What accessories it comes with? Well, it provides you with 3 solid brass rods for cleaning your rifles, shotguns, or pistols, 8 bronze brushes (for 22-cal, 270-cal/7mm, 9mm/.38/.357, 30-cal/8mm,.40-45 cal/10mm20/28-ga, , 410-ga, and 10/12-ga) and 5 mops (for 22-25-cal, 20/28-ga, .38-357-cal, 410-ga, and 10/12-ga). Additional accessories include 5 spear pointed jags, 2 slotted patch loops, a double end nylon brush, double-end nylon cleaning pick, up to 50 cleaning patches, and a shotgun accessory adapter. Probably the best thing we loved about this kit is how it allows you to carry your cleaning supplies in style. That is, it comes with and super-stylish wooden carry case with an aged-oak finish for easy storage and portability. 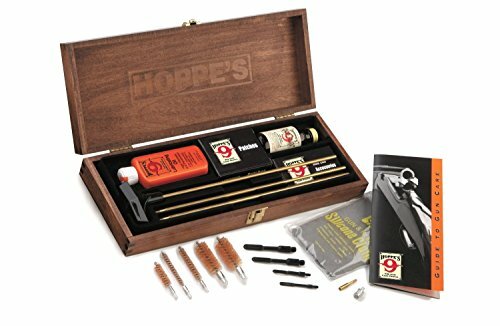 Whether you want a rifle, shotgun or pistol cleaning kit, all an all in one kit that cleans different types of firearms, Hoppe's Universal Gun Cleaning Accessory Kit will meet your needs and expectations. 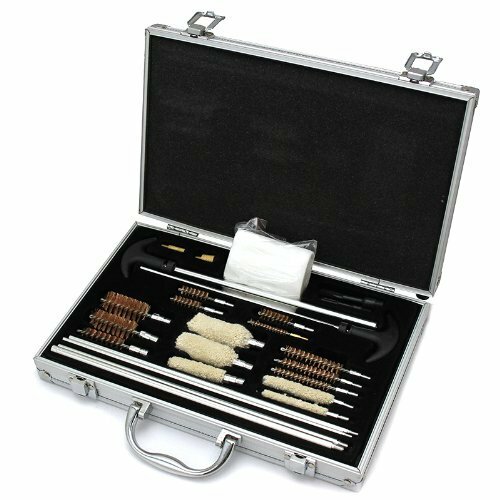 Also priced within an affordable range, this universal gun cleaning kit is made up of 3-piece universal aluminum cleaning rod, with varying sizes to help you easily clean through barrels of different lengths. It also presents you with up to 9 different bore brushes made from the heavy-duty phosphor bronze for maximum longevity. Keep in mind that these brushes are capable of accommodating just any firearm caliber—including the .22, .270, .30, .357, .40, .41, and .44. It can also accommodate the 12 and 20 gauges. Like in all the other universal kits discussed in this list, this model comes with detachable, soft cotton swabs. The fact that they’re made of cotton means they’re 100% machine-washable and reusable. And yes, this kit also comes with a sturdy case to enable you to easily organize and store all your cleaning supplies or carry them with you to any place. The last spot in our gun cleaning kit reviews goes to the Otis Technologies FG-211 Cleaning System. This is the perfect kit for you if you want to clean your pistols and rifles the best way. Like all the other Otis cleaning systems, this package comes with high-quality clearing accessories that’ll help you get the job done easily and quickly. It comes with unique cotton patches that you can use to create swabs with 360-degree coverage. And this allows proper breech-to-muzzle clean for your .22-.45 caliber firearms. A total of 7 bore brushes are also included in the package (they include: .22/.223, .243-6mm, .270, .30/.308/30-06/30-30, .338-.35, .38/9mm and .40cal). Like in the other Otis cleaning kit, this package also comes with aircraft grade memory-flex cables (for proper breech-to-muzzle cleaning) and small and large obstruction removers. Proudly made in the USA, the cleaning kit comes with a lightweight, compact soft carry case to ensure easy organization and portability. A comprehensive instruction manual is included to make the kit easy to understand for beginners. In order to get the perfect gun cleaning kit for your specific firearms collection, you’ll need to know what to look for in a cleaning kit. What type of firearms do you intend to clean? For this particular reason, the cleaning equipment needed to clean one gun is entirely different from the other. For instance, the best pistol cleaning kit for 12mm pistol cannot be used to clean .45 magnum. Before you buy that gun cleaning set, make sure it has a cleaning component specially designed for the gun you plan to clean. Some models are designed to handle types of guns; these are great for hunters and hooters who own several guns. If you only have one, consider looking for a set made for that specific gun. You should also consider the number of cleaning components that come included in the cleaning kit you want to buy. The truth about cleaning kits is that the number of items varies as you move from one model to another. For universal cleaning systems, you can expect the number of pieces to range from 20 to 100 or more! The more items a kit contains, the more it’ll cost you. In most cases, you might not need all the items included in the package. But again, you might want to have as many cleaning items accessible to you. You should simply let your specific gun cleaning needs and requirements guide you here. TIP: The perfect kit for you should come with all the basic gun cleaning supplies (refer to our earlier section on ‘What You Need To Clean Your Gun’). What’s the quality of the cleaning accessories? You don’t want to spend your money on a cleaning kit that starts wearing out or breaking after only a few uses. For this reason, you should pay close attention to the quality of the gun cleaning supplies that come with your kit. Make sure the cleaning rods are made from durable materials like solid brass that don’t break easily. The brushes too should be made from durable materials like phosphor bronze, carbon fiber, etc. A kit comprising of high-quality cleaning components will last longer and give you value for your money. Having bought other gun-related supplies and, you already know that price always varies as you move from product to product. Factors that usually affect the price of a product include the brand, quality, etc. If you’re a dedicated hunter/shooter who use their guns almost daily, you should consider getting you’re a premium kit for longevity and excellent cleaning results. This will require you to spend more though. For those who rarely use their guns, you can get away with an inexpensive kit that’ll help you take care of your firearm once in a while. At some point in your hunting life, you might need to carry your gun cleaning supplies with you. If you want to avoid headaches and make things easier for when this time comes, make sure the cleaning kit you invest in comes with a convenient carry case. This will allow you to neatly arrange all your cleaning items and securely transport them to just any place! How To Use A Gun Cleaning Kit? The very first thing you should always do when you set to clean your gun is removing any ammunition that’s still loaded. Once you’ve double and triple checked that your gun contains no ammunition, you can then disassemble as much as it’s allowed. Use your firearm user manual to guide you through the disassembly process. If you don’t have a manual, scour the internet (including the manufacturer’s official site and YouTube) for one. Also, make sure the gun you’re cleaning is actually meant for assembly. If you’re less family with firearms, you might not know that some guns—like the revolvers and handguns—don’t require to be disassembled. Taking apart such guns might lead to irreparable damages! Your gun components are now taken apart and ready for a thorough cleaning. -Ensure you’re in an open or well-ventilated area. A large garage or outdoor setting will do. This is because gun cleaning oils and solvents might emit strong fumes which might not do good to your body when inhaled. -We also suggest that you put on a pair of gloves to prevent the oil from getting absorbed into your skin. 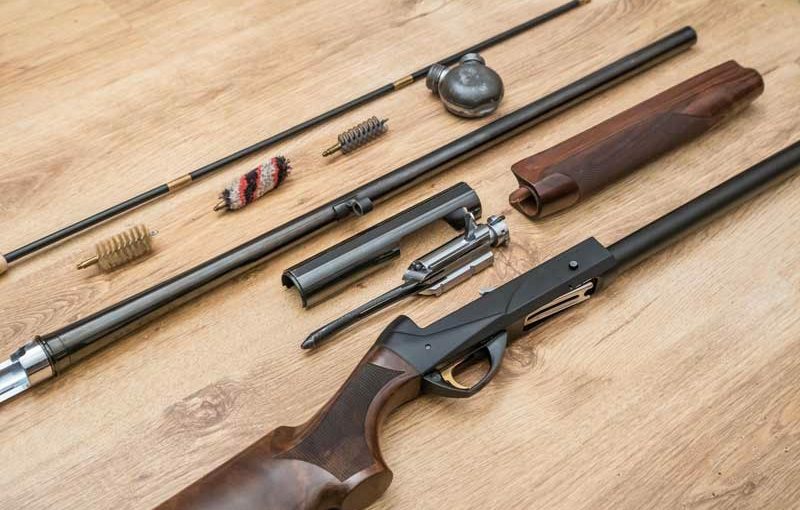 To clean your gun barrel, you’ll need to use the metal cleaning rods and cleaning patches (included in your gun cleaning kit). Soak a patch in the solvent and ensure it gets fully covered. Then, attach it to the top of a cleaning rod and use a patch holder to help you hold it down. Now push the rod (with the patch attached) through your gun barrel length until it comes out at the other end. DON’T pull it back once it comes out at the other end. This will cause the debris and residue to readjust inside the barrel—which simply means you’ll be doing zero work. Apart from the rod, you’ll also need to grab a bore brush and insert it into your gun barrel to help scrape off debris and residue attached to the inside. Alternating the cleaning patches and bore brush will help remove all the carbon residue residing inside. When you’re sure you’ve removed all the residue, consider sliding another patch slathered with the lubricating oil through the barrel with the help of a rod. Now put some gun solvent inside your firearms action mechanism and give it some time to work its magic. Then, grab your bore brush and use it to scrape away any residue remaining. Afterward, take a dry cloth and use it to wipe away any remaining residue bits until it’s entirely clean. When you’re satisfied that your gun action has no carbon residue, apply the lubricating oil on its moving parts to help keep off the rust and prevent tear and wear. The last (and the easiest part) involves wiping down the exterior of your gun. This is soo easy that all you have to do is grab the polishing cloth included in your kit to wipe your gun surface. If your cleaning kit lacks polishing cloth, you can simply use a washcloth, towel, or even an old t-shirt. Be sure to wipe away all the fingerprints, marks, smudges, etc., on your weapon’s exterior to give it a mirror-like look. Now that your gun has enjoyed a thorough clean, you can put it together and head out for the next shooting! Is It Possible To Clean a Gun Without Gun Cleaning Kit? What if you have misplaced your kit, you’re far from it, or you simply don’t have one…can you still be able to clean your gun properly? The simplest way to do this is using an old t-shirt that you don’t use anymore (it must be clean, though) and cut out several squares out of this. These will act as your cleaning patches. You’ll also need some lubricating oil, in which you’ll deep the square pieces to help you remove the carbon and debris inside your gun barrel. You’ll need a rod-like object to help you push the cleaning pieces through the gun barrel. The cleaning process is similar to the one we’ve outlined above, only that this time you’ll be using different objects. Check the complete guide on how to clean a gun without a cleaning kit. All in all, we still recommend using the gun cleaning kit as the BEST and most convenient way to clean your firearm. A good kit will provide you with all the cleaning supplies and help you neatly organize them in a lightweight case that you can carry with you to any place! 1. What is the best gun cleaning kit? 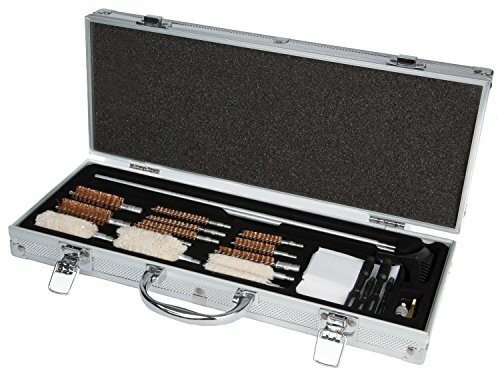 The best gun cleaning set for you should depend on factors such as the type(s) of firearms you want to clean, your budget, and your unique gun cleaning needs. Refer to our list of the 15 top-rated cleaning kits to find out which set fit your unique firearm cleaning and maintenance needs. 2. What happens if I don’t clean my gun? The residue left behind when you fire your gun will accumulate with time and affect proper functioning of your firearm. This means it’ll affect your shooting accuracy. An improperly functioning gun can also mean a hazard for you and those around you. 3. How often should I clean my gun(s)? How often to clean your firearms should depend on how frequently you use them. The more you use your gun, the more you should take time to clean it. 4. Should you clean a brand new gun? Yes! Cleaning a brand new firearm is just as important as cleaning your existing un before using it. As you already know, the new guns usually contain grease and sticky solvent to ensure they don’t rust for sitting idle on the shelves for months/years. Cleaning the new gun helps remove this greasing (which btw isn’t the real shooting lubricant) and clean your gun to make it ready for excellent performance. And oh! Cleaning your gun will help you familiarize yourself it as you get to know it works. It’ll also help you inspect it for damaged/broken/worn out parts. Make regular cleaning and maintaining of your gun a necessary ritual if you want it to stay with you for an extended period of time while allowing you to take those accurate shots that leaves your fellow hunters/shooters awed! The feeling of shooting with a super-clean gun alone will double your shooting confidence. The task of cleaning your gun have been made easy by the gun cleaning kits—which are basically packages that come with all the crucial items you need to remove any carbon and gun powder remaining in your gun barrel and lubricate it for reduced tear and wear. All you need to start taking care if your weapon is the best gun cleaning kit. Order one of the 15 most popular gun cleaning kits above and give your gun a long life and a flawless performance! Best Holster For Sig P229: Which One To Choose in 2019?